I used to hate sunflowers. When we opened Fly Me To The Moon I wouldn't even buy them for the shop. But, then customers began asking for them so I had to start carrying them. 1) They were over-sized, looked cartoonish and weighed a ton a lot. 2) The contrast between the dark brown center and the bright yellow petals was too strong. 3) They were usually poorly arranged with flowers they had no business being with. 4) There was just nothing elegant about them. But, then when I opened an Instagram account for the shop, I began to see sunflowers in a whole new light. All those artisitic shots of sunflowers gave me a diferent perspective. 1) Sunflowers are inexpensive. You can get a bunch of them without breaking the bank. 2) Sunflowers last quite a long time. They last well over a week if you give them basic care. 3) You don't need a lot of sunflowers to make a statement. A single sunflower in a vase makes a powerful statement. The more, the merrier. 4) They look great when casually arranged by themselves. No need to get fancy. Just cut them and place them in a vase. And whatever you do, please don't add baby's breath. 6) When the yellow petals start falling off, pull off the rest of them and you have a sunflower with a whole new look. If you never liked sunflowers, I hope this post will encourage you to give them a second chance. Why Fly Me To The Moon Florists? People often ask how we came up with the name Fly Me To The Moon Florists. I woke up at 3:00 a.m. one morning, knowing that it was the right name and hoping that my business partner, Dave, would feel the same way. He did. That was nearly 7 years ago and we have no regrets. Since our goal was to create a sophisticated yet affordable, Manhattan-style boutique flower shop in downtown Yonkers, we knew only a clever name would do. Besides being the title of a popular song, we believed that Fly Me To The Moon would imply that our flowers would always be high quality, unusual and way beyond anything you'd ever expect. Our reviews on Google and Citysearch seem to indicate we're headed in the right direction. Note to Self #1: If you plan to give your business an unusual name don't expect your friends and family to get it. People we knew thought it was the dumbest name in the world. But, when I began attending industry trade shows they loved the name and thought it was brilliant. Once we actually opened Fly Me to The Moon, customers thought the name was great. They said it was creative and memorable. Exactly what you'd want a business name to be. Note to Self # 2: Don't expect people to understand your logo either. As you may have noticed, there's not a single flower in it. Our friends and family thought that was stupid too. No one actually used that word, but the looks we got were, well, less than encouraging. We used an onliine logo development company called Logoworks. We wanted to capture a metropolitan, cool vibe with a nod to the past. We were really quite pleased with the logo they designed until we started showing it to people. Everyone we asked had an opinion. They all thought there needed to be a flower in the logo, but sticking one in there just so it would be there seemed wrong to us. We were just about ready to tell our Logoworks project manager we wanted to scrap it until he said, "Really? I think it's one of the coolest logos I've seen." Though everything in me wanted to scream, "I bet you say that to all your clients!" Dave and I both thought, you know, he's right. Though nobody else liked it, we knew in our hearts it was right for the brand we were building. So we stuck with it and we're happy we did. Note to Self # 3 Fly Me To The Moon, regardless of how creative and memorable it is, is way too long. Especially for online usage. So if you're naming your business, go short if you can, but not so short that you lose the essence of what you're trying to say. So that's the story of how we got to be called, Fly Me To The Moon. What's the most unusual business name you've heard and does it fit the business? 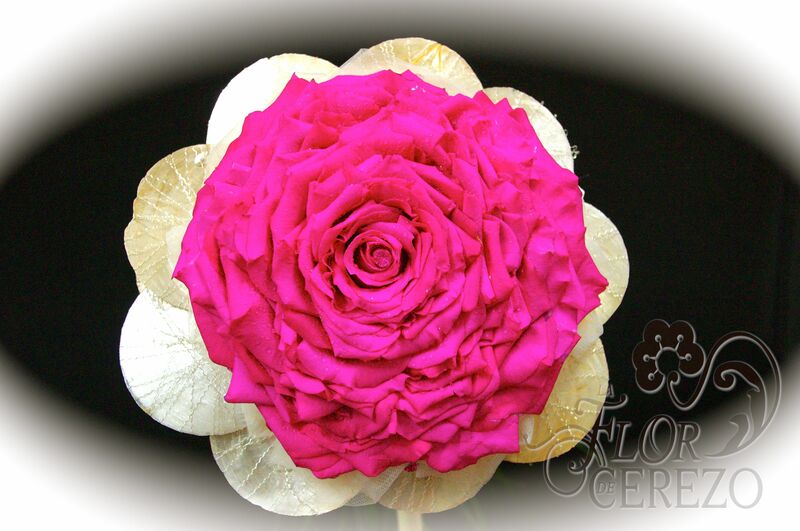 A glamelia is a bouquet made from combining petals of many flowers to create one large one. Glamelias are sometimes called composite bouquets or rosamelias, if they're made of roses. They make beautiful bridal bouquets. I did a 4 part series on glamelias, which will tell you just about everything you'd ever want to know about them. You'll find the individual links to those posts as well as my glamelia Pinterest board at the end of the post. Meanwhile, I hope you enjoy these lovely pink glamelias. I hope you liked this pink glamelia gallery. We've begun experimenting with glamelias/composite bouquets here at Fly Me To The Moon Florists. Though labor intensive, especially to make them perfect, they're not as difficult to make as I had imagined. Perhaps we can add them to our line of wedding flowers in the future. It's your turn. What do you think about glamelias?